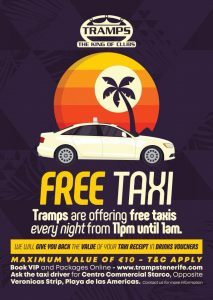 Every Friday, Tramps brings you the very best that Tenerife has to offer regarding R&B / Urban nights with resident DJ Snoopy & special guest DJs performing weekly. Come and join us for an unforgettable night of R&B, Hip Hop, UK Grime, Reggaeton, Afrobeats, Garage, Moombahton and Dancehall music, dancing the night away until 6am. Room 2 – Cocos the party room is also open.